The Henry Tax Review is a work in progress, but it has already advanced sufficiently to constitute an important case study of state capacity in Australia. 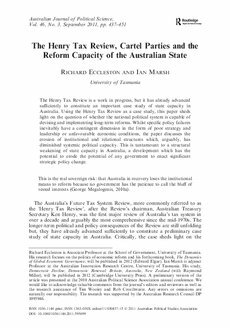 Using the Henry Tax Review as a case study, this paper sheds light on the question of whether the national political system is capable of devising and implementing long-term reforms. Whilst specific policy failures inevitably have a contingent dimension in the form of poor strategy and leadership or unfavourable economic conditions, the paper discusses the erosion of institutional and relational structures which, arguably, has diminished systemic political capacity. This is tantamount to a structural weakening of state capacity in Australia, a development which has the potential to erode the potential of any government to enact significant strategic policy change.